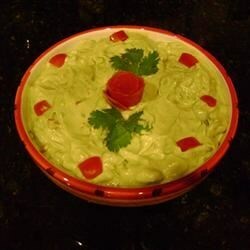 "This old family guacamole recipe is perfect with corn chips. For family holidays, parties, barbecues and get togethers, we always have this made. It's great this way - but you can also add onions or tomatoes or whatever you like." In a bowl, beat cream cheese with an electric mixer until smooth. Add two avocados, green chiles, Worcestershire sauce, garlic salt and pepper; beat until fairly smooth. Gently mix in remaining avocado, leaving it a little chunky. Serve immediately or store in refrigerator covered with plastic wrap, pushing the wrap down so that it is touching the entire surface of the guacamole. I played with the ingredients a bit, but made essentially the same thing. Delicious. Adding a pinch of dill and fresh garlic is a bit more to my taste. I made the mistake of bringing this to work for a birthday party. Now I get requests from every department to bring in more! Leave cream cheese out to soften (or gently nuke). I inadvertently left off the garlic (minced or powdered) to taste. Enjoy...Great pic, Nandabear. This was really good I used the guacamole in a bag from Sam's to speed things up, I was in a hurry. It turned out great! Very tasty. My children do not like tomatoes or white onions so this is a perfect guacamole for us.